We have only one game this week. An easier day for me :) . The game for this week is Undercover Cops. 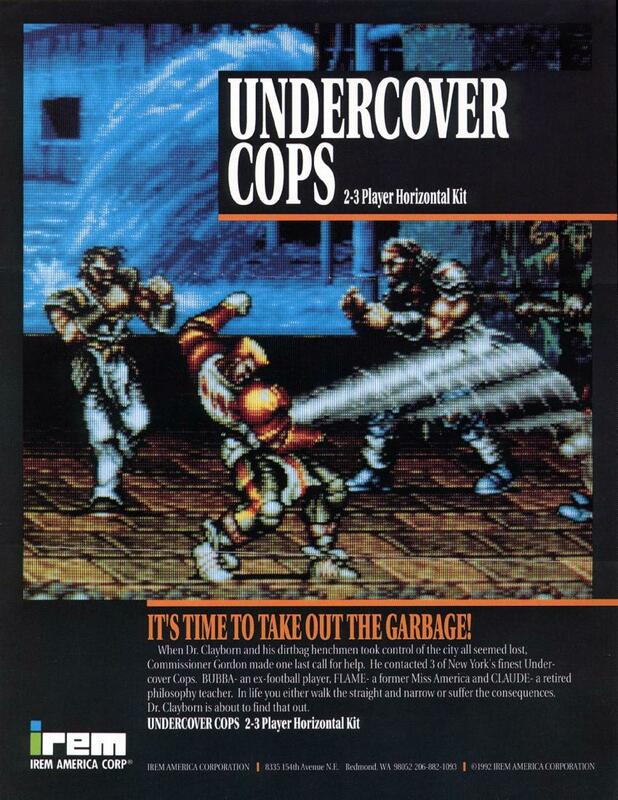 Undercover Cops was created but Irem and released in 1992. Undercover Cops is a 2.5D beat 'em up in which you are a city sweeper in the year 2043 trying to stop the crime that is destroying the city. You find yourself fighting thugs, mole creatures and even mutants. The enemies never drop their weapons but throughout the stages some objects can be picked up such as steel girders, concrete columns, oil drums and more. To restore health food is sometimes dropped from creates and barriers. Mice, frogs, birds and more also appear dropped by some thugs and items which the player as also eat to restore health. Claude - Code Name: Lightning Slasher - An ex-karate master, he was banned from tournaments after killing a man while protecting his girlfriend. Bubba - Code Name: Fire Ball Crusher - An ex-pro football player, after being false accused of murder he was banished from the world of football. Flame - Code Name: Blue Gale Revenger - An ex-Female vigilante, she was the only female vigilante but her lover was killed by villains. The game has 5 stages for you to fight through each with a boss battle at the end.